High Octane Photos Blog: Tumbler. Without a doubt, when it comes to movie cars, some of the coolest cars come from the Batman franchise. 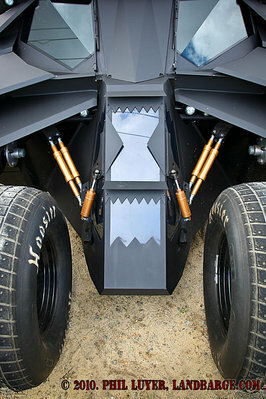 The latest in this line up is the Tumbler, from the Christopher Nolan directed films Batman Begins and The Dark Knight. Only four full size vehicles were built for the movie, but at least one collector from Japan was determined to get his hands on a Tumbler. In order to do so, he enlisted the help of a couple of guys from Perth, Western Australia, best known to many for their replicas of the Interceptor from the Mad Max films and if you head over to their website, you can check them out for yourselves. Building this replica has been a four year project for Grant Hodgson and Gordon Hayes of Mad Max Unlimited, and now that it's almost over, they have no plans to make another Tumbler. While they've certainly proven it's possible, the complex panel work involved has been a lot more time consuming than expected, although not without it's rewards. 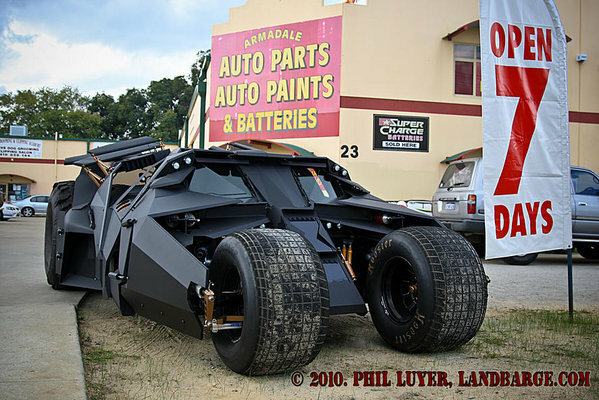 The Tumbler replica has already been featured in one national magazine, and will soon be featured in one of the biggest modified car magazines in Australia. It's too late to catch a glimpse of this car on Australian soil, as it's leaving for Japan very soon, but it will be on display in a privately owned museum over there, along with some of Grant and Gordon's other work. If you speak Japanese, or just want to look at the pictures, here's the website of the museum that commissioned this replica.